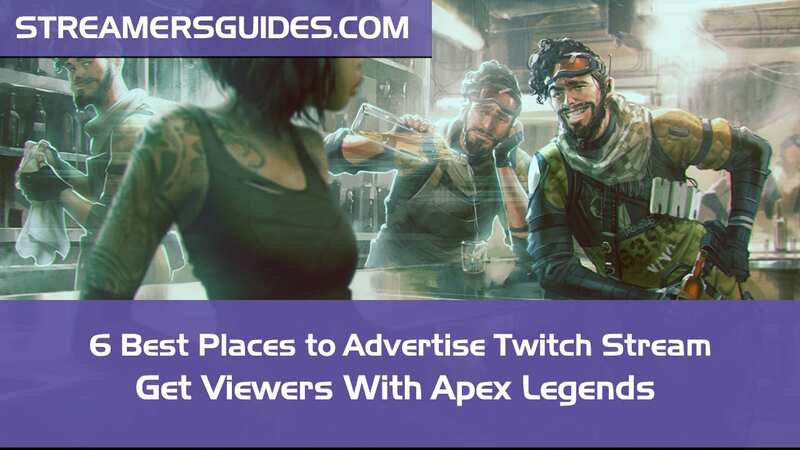 Home Streaming Guides Twitch Marketing Social Media For Twitch Streamers Apex Legends – 6 Best Places to Advertise Twitch Stream – RIGHT NOW! Apex Legends – 6 Best Places to Advertise Twitch Stream – RIGHT NOW! How to Stand out – Get Viewers with Apex Legends? Step 3: Go live like a Pro! Apex Legends is out! I’m pretty sure that you have seen everyone and maybe even their moms playing it right now. I have seen it popping up quite a lot in different social medias and it is currently the game with the most views with 163k viewers. I have seen that not that many streamers actually advertise their streams where the gamers are. What is this madness? 😀 Big streamers have already taken the top spots and there is thousands of other streamers that are ahead of you with viewer counts. We are going to use the same thing that we used couple years ago in one of the most saturated games ever which was CS:GO. Here is a case study of earlier planned laser targeted marketing. Before we can really get going with the marketing aspect we need some content. So go ahead and play Apex Legends and ask your moderators to take screenshots and clips that you can use. After you have 2 or more interesting clips you are almost ready to go. Every social media platform loves when you upload content in their own platform. If you have been doing just links to Twitch from Facebook groups and such and they do not get any likes or this is one of the reasons. Other reason is that they don’t get comments. When you get comments, likes and comment on other peoples posts the social media platform thinks you are of high value and your posts should get seen by more people. The people you chat with and tag in comments are most likely going to see your posts when you have actually talked together in the comments. So make sure to like and provide a useful / funny comment for 10 or more peoples posts before even uploading clips. Just chat about Apex Legends.. What class you like to play? Which class is better in what situations etc.? After you have done that upload your clip or share a screenshot. Make sure that the description of your uploaded clip / screenshot is interesting. Watch what others have posted, you get the idea 🙂 But don’t just link drop! Okay, since you have all the needed requirements already ready you can go live. Important thing to note is that don’t do this whole thing in the span of 10 minutes or you maybe considered a spammer. Sweet spot to start is about 3-4h before you stream everyday. Yes you can do this everyday this works like magic even in saturated games. But currently there is an awesome sweet spot that other bigger games like Fortnite don’t have. Here are my recommendations for going live notifications that you can use. We already tested what works badly and what works better. We are going to use Facebook Groups for advertising. This is an awesome spot since there is thousands of new people joining daily and being right now in the groups as the top streamer is HUUGE! That’s all for this article today. I hope it helps you out 🙂 This same style you can use basically in every game also. By preparing and advertising in places where the actual viewers are you can grow. Let me know how your promotions went in Twitter. Would be awesome to hear!